Review: "Seventh Wonder: The Great Escape" - Sea of Tranquility - The Web Destination for Progressive Music! Progressive metal is a genre which continues to produce so many fantastic bands that consistently release amazing albums just like this one. In 2008 Mercy Falls was unquestionably a hit for the band Seventh Wonder; their wonderful concept release impressed the older and won over many new fans for this Swedish group. 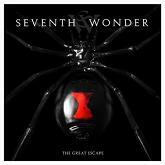 In 2010 Seventh Wonder's fourth album The Great Escape is soon to be released, and it's a CD that will once again generate many discussions about how exceptional this band truly is, and of course like their prior recordings receive substantial play time. So what makes this band so good? Well, like any of the finest progressive or any top band for that matter, Seventh Wonder know how to compose great songs that captivate from the start. In conjunction with their high level of precision musicianship and not to forget that captivating voice of vocalist Tommy Karevik, Seventh Wonder is the complete package. The other point I could make is Seventh Wonder isn't the sort of group where one or two members really stand out. Sure there are moments but overall they just perform so well as a complete tight knit unit.The Great Escape has fine songs like "Wiseman" and "Alley Cat" with that familiar Seventh Wonder intricate melodic music and more, while they aren't the heaviest progressive band around their music is definitely potent enough to be classed as metal. "The Angelmaker" is overflowing with Seventh Wonder's wonderful progressive music and the complex "King Of Whitewater" is also a highlight. A welcome addition is Tommy's sister Jenny Karevik who is heard once again with Seventh Wonder on the very inviting song "Long Way Home", obviously great vocals run in the family. "Move On Through" has more of that Seventh Wonder magic, as they just lock into each other's playing so well, but it's such a shame drummer Johnny Sandin has decided to leave the band. I hope they can find a worthy replacement.You may be wondering why there are just seven songs and well it is little wonder, the biggest difference this time is Seventh Wonder have really gone all out, as the final number "The Great Escape" is an triumphant epic exceeding thirty minutes. This title track really is something else, as Seventh Wonder keep you engrossed on this substantial musical ride. "The Great Escape" is based on the book Aniara by the Swedish Nobel Prize winner Harry Martinson, and as you would expect there are many clever instrumental passages by the Seventh Wonder guys along the way. Waiting In The Wings, Becoming, and Mercy Falls were all first-rate recordings, well, prepare to be blown away once more by Seventh Wonder on The Great Escape. It's a damn shame when bands release an album very late in the year, as often times the CD will not get reviewed in time to rate its merits among the rest of the years highlights. Such was the case with Seventh Wonder's excellent The Great Escape, which came out here in North America in the last few days of 2010, and didn't get into my hands till a few short weeks ago. This is another tremendous release from these multi-talented Swedes, who are quickly becoming one of the best bands in the progressive metal genre. As with the rest of their back catalog, The Great Escape is epic all the way, and littered with a non stop barrage of catchy melodies & vocal harmonies, thought provoking conceptual lyrics, and impeccable musicianship. Though they draw plenty of inspiration from Scenes From a Memory era Dream Theater, you can also hear bits of classic Styx, Kansas, and Journey in their music, especially in the vocal hooks, but musically speaking they know their metal and progressive rock. No shortage of winners here, from the catchy prog openers "Wiseman" & "Alley Cat" (complete with some sick shred guitar from Johan Liefvendahl), the complex "The Angelmaker" (hooks to die for on this one! ), the emotional ballad "Long Way From Home", the intricate "Move on Through", and the 30 minute epic title track. Loads of guitar, keyboard, and bass solos on the latter, but the tune is never boring and flows nicely, and lead singer Tommy Karevik really shines throughout. Kudos as always to bassist Andreas Blomqvist, who is generally up front and center right alongside Liefvendahl & keyboard player Andreas Soderin. You rarely hear bass so prominent in progressive metal these days (John Myung, are you listening? ), so it's a joy to listen to this guy. Let's not forget the tight drumming from Johnny Sandin, who holds everything together perfectly. This would have easily been in my Top 10 of 2010-fabulous stuff from an incredible band. If you long for the more melodic style of Dream Theater's early material, then you need to check this band out.